Brita makes it easy to drink healthier, great tasting water for pennies per gallon. 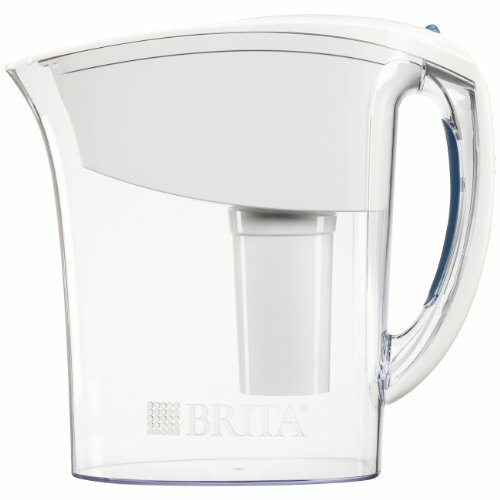 Brita Atlantis Water Filter Pitcher is BPA free, and reduces zinc, chlorine taste and odor, copper, mercury and cadmium, all of which may be commonly found in tap water. For optimal performance, use the filter indicator to track when to replace the advanced filter. Ergonomically designed, this water pitcher features a flip top lid for no fuss refilling and a comfort grip handle for easier pouring. Its compact, 6 cup capacity makes this pitcher perfect for a small kitchen or office. Plus one water filter can replace up to 300 standard 16.9 ounce plastic water bottles, cutting down on waste and saving you money. Get great taste, less waste and more savings from Brita.